It is not always possible to get great visuals for stories you are working on, particularly when you are dealing with subjects from the past, future or simply have a lot of data spread out over a large geographical area. This might be the whole story or just a segment to give a broader context for an issue, show a map, or simply statistics.This is when you should think of moving infographics as a great way to make your story more engaging on a digital platform. Here is an example of a story where moving infographics work well. There are two approaches to the animated infographic. Either write a script, record it and then set about finding graphic elements that you can move on the timeline. Or write a simple script comprising the key issues you want to discuss and then combine that text on screen with graphic elements. For most journalists creating moving infographics seems like a task well beyond their limited technical skills, but new software and websites have made creating engaging animations and embeddable static graphics well within the reach of everyone. In the first section, I introduce After Effects, the industry standard infographics software tool. It’s a complex software so in this section I will get you started with some basic projects. Once you feel comfortable finding your way around the package you should have the confidence to go and create something more elaborate by yourself. 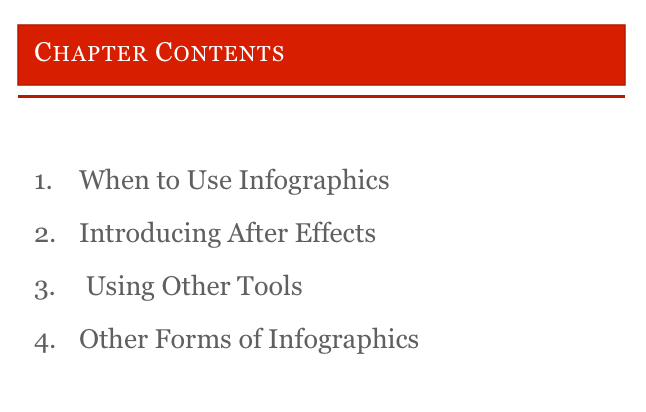 In the second section, I introduce a number of other tools you can use to create moving infographics. I start with Premiere which by this point you should all have a basic grasp of. Many NLE’s (non linear video editing) packages are perfectly capable of creating basic inforgraphics if you want to keep things simple. Some, like Premiere, also come with animation presets that can help you get started. Then I look at using a presentation software like powerpoint, Keynote or Prezi, recording the screen so you can bring it into a video editing package to fine tune and add the audio. I also look at using free online static infographic packages to help create some of the elements and then bringing them into Premiere to animate. Finally I look at the growing trend of creating content rich video. In the third section, I look at creating embeddable interactive elements to help tell your story. In this I cover finding copyright free maps you can use in your projects. Then I look at data visualisation using free online tools, particularly useful if you have a data set that you want to make look more visual. Then I take a brief look at making images more engaging by making them zoomable or spin 360 degrees. To finish the section I discuss using free tools to make a timeline to explain a story that unfolds over time.